Sometimes, my job is pretty awesome. One of those times last weekend when I was sent to Indy during the Final Four. The weekend started out with two of us, but ended up with three of us. C.W. #1 and I headed out early Thursday morning for a full day of assignments once we got to Indianapolis. We parked our car at the J.W. Marriott in downtown Indy and walked from there. The full Final Four rush wasn’t in town yet, but downtown was already getting busy and one of our stops was at the J.W., so it just made sense. When the day was over, we were tired, hungry, and wet. We still had to go back to the J.W., so we decided to pick up a bite there before heading to our hotel outside of the city for the night. There are two restaurants on the ground floor of the J.W. Marriott in downtown Indy. One is a sports bar. The other is an Italian restaurant. I like sports bars and C.W. wanted a steak. 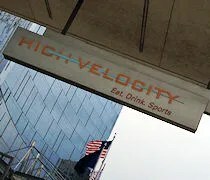 We picked High Velocity Sports Bar. 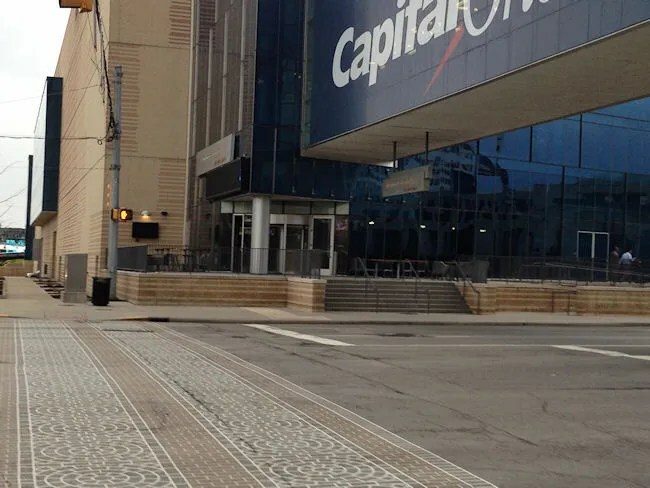 It takes up a large corner of the hotel right at the corner of South West Street and Maryland Street on the west side of downtown. There is an outside entrance accessible from that corner, but the hostess station is at the entrance accessible from the hotel. After we put our bags back in the car, we headed back to the bar hoping we could get a table. It looked pretty packed, but most people were actually just drinking at the bar. We were shown to a table for four in the dining room. Our hostess dropped off the menus and showed us the drink menu so we’d be ready when our waiter came over. 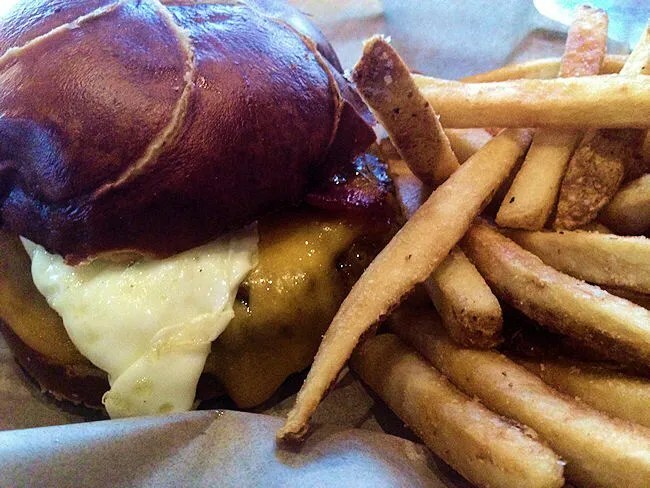 I like sports bars because I like burgers. I like high end sports because I like high-end burgers. 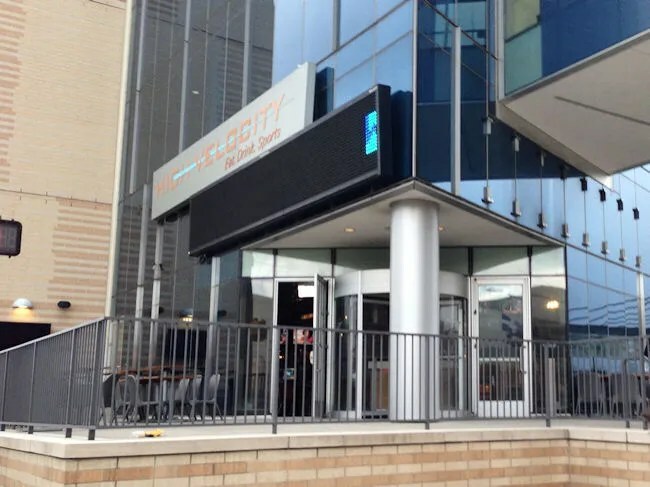 Being inside the J.W., High Velocity is a high end sports, so I wanted a high end burger. I ordered the Build Your Own Angus Beef Burger. The sandwich comes with choice of cheese, but I needed more than just that. I topped it off with applewood smoked bacon and a fried egg. The sandwich came on a pretzel roll and with skin-on fries. The burger came out really juicy with a slightly pink center. The toppings on the sandwich all worked together in conjunction with the delicious meat, so nothing overpowered, and nothing got lost in the mix. The pretzel bun adds strength to the sandwich and soaks up all those delicious juices from the egg, bacon, and, of course, the meat adding another layer of deliciousness. The fries were good, but a little too salty. That didn’t stop me from clearing my plate. It just made me drink a little faster. I was so hungry that it didn’t really matter to me, but a little less salt would have made the fries a little better. C.W. got the steak that he wanted. He got the Grilled New York Strip which came with mashed potatoes, steamed broccoli, and caramelized onions. He added on sauteed mushrooms to the steak, and, like me, left nothing on his plate for the kitchen to throw away. My bill was just under $30. High end sports bars in high end hotels come with high end prices. The burger was $17 by itself. It was a delicious meal and I enjoyed every bit of it, but at the same time, I’ve had the exact same meal and little bit less high end sports bar and paid about half that price. High Velocity worked out for us out of convenience and both of us enjoyed the meal. I would eat there again, but probably only on the company dime.